This week was mostly focused on cleaning up several issues and making improvements to emails — but we did manage to sneak in the start of our consigned vehicles support. 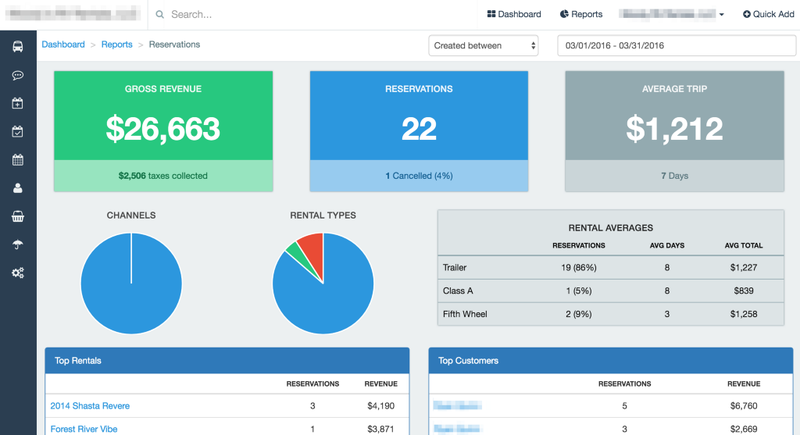 A lot of our larger users manage rentals on behalf of private owners. It’s a great arrangement, but requires some unique reporting and tracking features to make sure your private owners are kept up to date on their vehicles usage. We’re hard at work on some robust reporting for consigned vehicles, but in the meantime we’ve rolled out an option that lets you set who the owner of a particular vehicle is. For now, this is a great way to keep the contact information available for a vehicle’s owner at all times, but we’re working on custom reporting and owner reservations that’ll make managing your consigned vehicles a breeze. Stay tuned! [Update] Emails are less annoying, but more useful. You’ll get alerts on new requests & messages, but no more pickup/dropoff notifications. Those were wicked annoying for users with more than a few RVs — Enjoy your clutter-free inbox. [Update] Made reservations editable after pickup/dropoff. This was a huge hassle for some users, so thanks for hanging with us while we got it resolved! [Bugfix] In some cases, phone numbers weren’t being stored for new customers. All fixed. [Bugfix] Some reservations would always report “Waiting for owner” on the quotes/reservations pages. This has been fixed — Thanks to everyone who helped us track this one down. Consigned Vehicles, Improved Emails and Lots of Bugfixes was originally published in Outdoorsy Development on Medium, where people are continuing the conversation by highlighting and responding to this story. Wooooo boy, are we excited to announce this one. Today we’ve released two features we know you’re all going to love. First, we’ve added global search to the dashboard. At the top of every page, you’ll now see a “Search…” option next to your company name. Click it, enter in anything you’re looking for, and we’ll do our best to find it for you. Find reservations, rentals or customers by name, rental, vehicle or anything else you’d like. No more trying to remember if a reservation is still a quote or not. Next up is a large update to our reporting features. We’ve added two new report types we think you’ll love. First, the “End of day” report will allow you to look at your days activity (or any range of days for that matter) including payments, departures & returns. We’ve also added a new report to give you an overview of all your reservations. This is a great way to view upcoming reservation income you can expect as well as view your average utilization by vehicle types. There’s some solid information in here, so we hope it’ll help you plan your year. [Bugfix] Fixed an issue where driving checks would sometimes freeze and spin forever. We think some of you actually watched it overnight…we owe you a drink. Global Search & Reservation Reporting was originally published in Outdoorsy Development on Medium, where people are continuing the conversation by highlighting and responding to this story. One of our most often requested features is adding the ability to include contracts and terms with your quotes and reservation receipts. We’re happy to announce that starting today you can now do so on your Outdoorsy dashboard. To make sure all future reservations and quotes have the correct documents attached, you can open up your account settings and click “Reservation Documents”. Any files you upload here will automatically be included on all quotes moving forward. The documents will also be attached to any emailed quotes or receipts moving forward. If you have some documents or files you need to send to a specific renter, but don’t want to include them on all reservations, you can do so easily by attaching them to a message for your renter. [Change] Payments are no longer the primary page. You can view a renters payments by clicking on the “Transactions” tab. Send Documents with Reservations & Improved Messaging was originally published in Outdoorsy Development on Medium, where people are continuing the conversation by highlighting and responding to this story. This week’s updates focus on reservation pages and making sure your renters are ready to go when they show up to pick up their RV. To that end, we’ve added a checklist to each reservation letting you know the payment and insurance status of each rental. 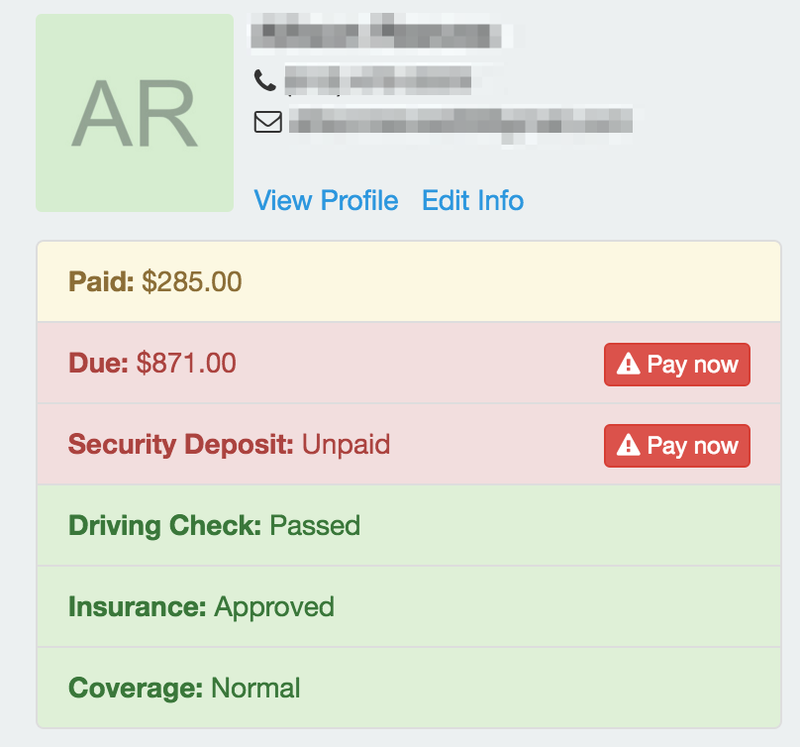 When you open up a reservation, you’ll now see an overview of your renters payment and insurance status along the right hand side. Items in green are completed, while items in red should be resolved before the renter departs. To resolve an issue, simply click on the relevant red action button. Long time users have probably noticed that we’ll sometimes require a photo of your renter’s license before they can be approved for insurance. Previously, this was handled by getting in touch with the renter directly to request the photo. We’ve added that functionality into the dashboard, allowing you to upload a photo on your renter’s behalf. If a photo is required, you’ll see the following alert inside their reservation. Once you’ve uploaded a photo, we’ll continue processing the insurance request. Processing is typically completed within a few hours, but can take up to 2 days in rare cases. [Bugfix] Reservations are no longer auto-progressed on the day of pickup. We now wait 24 hours. Driving Check & Reservation Improvements was originally published in Outdoorsy Development on Medium, where people are continuing the conversation by highlighting and responding to this story. We’ve pushed a large update to the calendar interface that let’s you view the entire month on one page, as well as link directly to your rentals for more information. [FIX]Clicking the back button used to go back by the letter — it was fun for us to watch but we decided to fix it anyways. Calendar Improvements and Bug fixes was originally published in Outdoorsy Development on Medium, where people are continuing the conversation by highlighting and responding to this story.